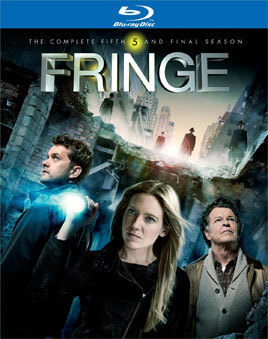 "The Complete Fifth And Final Season of Fringe" is now avaiable for Pre-order on Amazon.com for the release date is May 7, 2013. The DVD version is currently priced at $27.99 (list price $39.98) and the Blu-ray version is $34.99 (list price $49.99) - but with Amazon's "Pre-order Price Guarantee", if the Amazon.com price decreases between your order time and the end of the day of the release date, you'll receive the lowest price automatically, , and you don't get charged until it ships! Either edition will qualify for free shipping, and Amazon generally ships DVDs and Blu-rays early, so you can get them on the release date. May 7th?! Man I am gonna be so jonesing by then. Hopefully they will put lots of cool extras into the mix. Season 4's DVD set was almost devoid of such. I would love to see commentaries by Schapker and Wyman for the last two episodes. What would you like to see as extras? already pre-ordered - at least the last season. Will have to get the box set as well. Some video of the final wrap party would be cool too. According to the WB press release, the DVD & Blu-ray contains over 90 minutes of special features, including an exclusive "Farewell to Fringe" featurette, coverage of the Fringe Panel at Comic-Con 2012, producer commentary, and a gag reel.